News Survey: 'Food on the Table' - take part in a national Citizens Advice Survey about food. 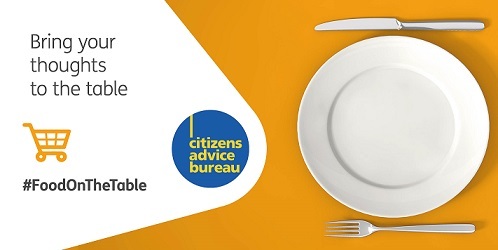 Survey: ‘Food on the Table’ – take part in a national Citizens Advice Survey about food. The Food on the Table survey will run for the next month. It is available online at www.cas.org.uk/foodonthetable and paper copies will also be available at the local Citizens Advice Bureau at 6 Moss Street, Elgin, IV30 1LU. There will also be an event promoting the survey on Thursday 4th October (10 am to 2 pm) at TESCO. A survey carried out for Citizens Advice Scotland in April found that 33% of Scots had gone without food in the past year due to lack of money (28% said this had happened between 1 and 6 times, and 5% said it had happened more than 6 times). The same survey also found that 71% of Scots were concerned about Brexit, and of these 65% cited the cost of food and other essentials as a concern; 33% also cited the availability and choice of fresh food.